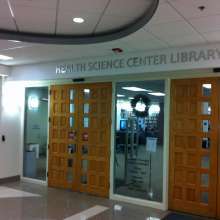 The Health Science Center Libraries (HSCL) at the University of Florida offer specialized expertise in searching and critical appraisal of the literature to researchers developing clinical and translational studies. Based on a personalized consultation, a librarian can develop search strategies, deliver curated bibliographies, provide summarized or tabulated review of the literature, or collaborate on conducting and writing systematic reviews/meta-analyses. The HSCL representative to the CTSI is always available for confidential discussion with investigators, can provide training for all research study personnel, and can match the project with the most qualified librarian. Submit your request electronically at http://library.health.ufl.edu/help/literature-search/ or call 352-273-8408 to be connected to a reference librarian.